This humbling image, taken by the European Southern Observatory’s VLT Survey Telescope in Chile, shows off one of the largest galaxy clusters we know of. The Fornax Cluster is a group of countless galaxies, some with large bubbles of material that seem to curve out from their galactic centers. This rich cluster is still one of the main ways scientists study galaxy mergers. One galaxy, dubbed NGC 1316, is especially noticeable here with large wispy loops jutting out from its glowing center. This elongated shadow was cast by one of Jupiter’s lesser known moons, Amalthea–and captured by the Juno spacecraft, currently orbiting the banded planet. The tiny satellite orbits just outside of Jupiter’s gossamer rings, and is the third closest moon to the planet. Just when you thought Mars couldn’t get any weirder, a photo like this gets sent back from the Mars Reconnaissance Orbiter. These strange squiggles live in a basin called Hellas Planitia. The fainter lines at the top of the image are simply sand ridges shaped by dust devils. But the more pronounced scratches at the bottom, called linear gullies, have a stranger origin story. Scientists think they form when carbon dioxide, frozen in the winter, thaws during the summer months and breaks off into blocks that carve these strange shapes. This colorful “chromosphere flash spectrum” image of the sun was taken during the solar eclipse on August 20. The sun’s chromosphere is the second layer of the sun’s atmosphere. Only some areas of the sun are observable with visible light, and others can only be seen during a total solar eclipse. Scientists took this rare opportunity to capture this red second layer of atmosphere as well as its spectrum of chemicals in the few seconds they had during totality. Last month, the Cassini orbiter sped through the cloud-tops of Saturn, where it ended its 13-year mission to study the planet and its moons in a dramatic suicide plunge. This black and white raw photo was one of its final snapshots, showing off the elegance of the gas giant from a distance of 581,000 miles. And see that tiny speck to the upper right, just outside the rings? That’s Pandora, one of Saturn’s innermost moons, sneaking into the image in a single pixel. Talk about an epic photobomb! 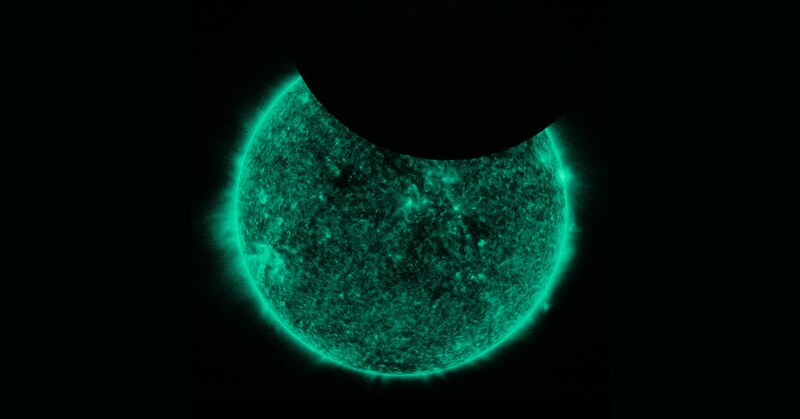 The moon is seen here transiting (that’s crossing in front of) the sun in this video released by NASA’s Solar Dynamic Observatory. This transit, captured on October 19, took around 45 minutes. Hello moon, we know you’re there.